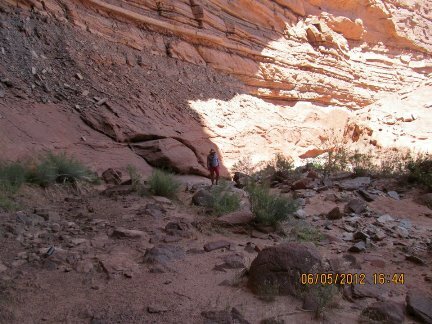 Final pictures of Desolation Canyon, UT and CO River. It’s pretty quiet tonight so I figured I might as well put up the final group of pictures from Utah. 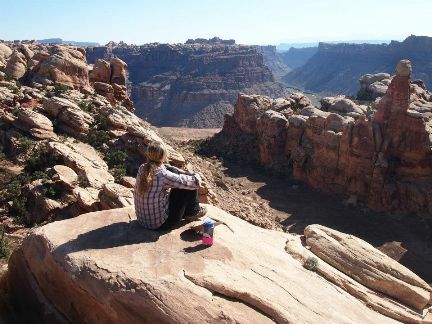 She only needed 3 weeks to finish up her research and so ended up on another trip down the Colorado River through Cataract Canyon once her three weeks were finished. 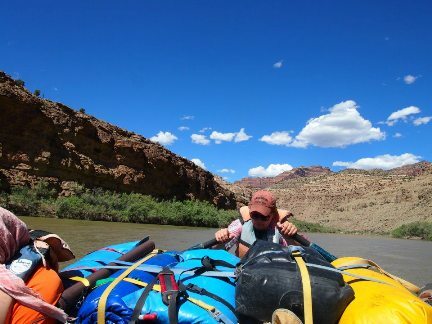 She spent a night between trips in Green River and then hopped on a small plane for a quick flight to catch up to a group that was already poised to put in the water. This is her rowing the raft loaded for three weeks. They all took turns and got to her research area in 1 1/2 days instead of the 3 it normally takes. 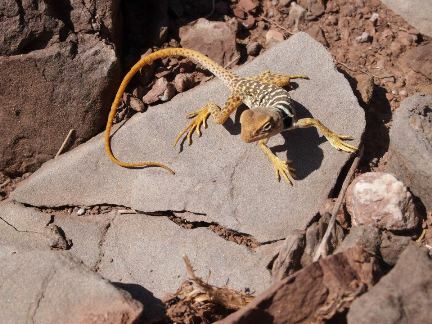 One of her buddies below. 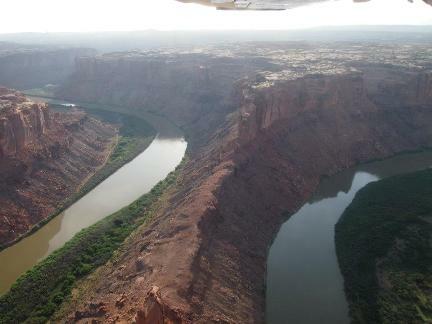 Colorado River…………….view from the air. Haze is smoke from various fires. Exploring a canyon close to camp below China Doll Peak. Hiking down from the peak. 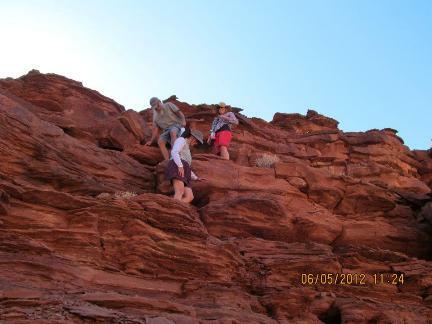 Working their way to Lake Powell. Haaaaaahaaaaaa, did I catch you with the title? Since it’s a bit of a slow news day, except for the fact that Obama finally evolved, and I’m not particularly interested in controversy right this second, I’ll just go ahead and put up a boring post. 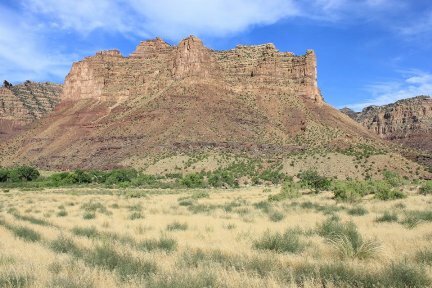 I’m not sure if any of you will be interested in this or not but I thought I’d mention that our youngest daughter is off to Desolation Canyon again to finish her research in fluvial geology (her mountain pictured above). She’s working on her Master’s at the Colorado School of Mines and will be finished with her thesis by the end of Sept. or early Oct. and has a job with an oil company in Denver beginning on Nov. 1st. This will be her last opportunity to get all the information she needs to complete her research. 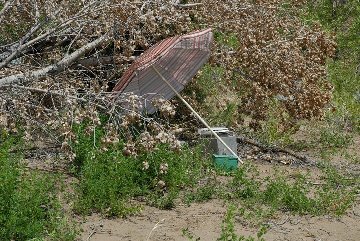 I thought some of you might be curious about life on the river. 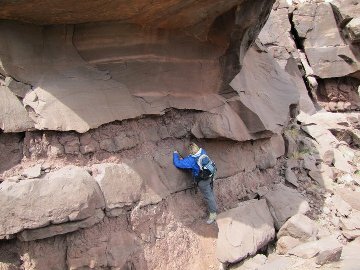 Apparently, her research area is somewhat unique, even for a geologist, in that it is so remote and lacking in amenities, so to speak. She is one of only two students on campus allowed to requisition the satellite phone and also takes a gps locator device she uses to send a message every day with their location mapped out. There are three possible messages which are pre-recorded, “all’s well”, “send help soon”, and “send help now”. She will use the satellite phone to get weather updates every five or six days and also of course, if there is an extreme emergency or if the locator doesn’t work for some reason. This will be her third trip. The first was about this time last year and it was a group consisting of her academic adviser, her industry adviser, a PhD student, two river guides and herself. They spent 10 days on the river in two different locations and she was able to see the lay of the land, and begin measurements and analysis of “her mountain”, which apparently is a fantastic out crop with lots of useful information for the oil industry. She’s taken a real right turn since being a water consultant. The weather was dicey this time last year and still very cold at night and they had several thunder storms and plenty of hail. During the first big down pour most of the tents were flooded at their primary camp and they had to dry everything out, not easy in cool weather and then set up new sleeping quarters on higher ground and dig moats around the tents for drainage. She and her advisers spent a lot of time on the mountain investigating the most useful areas and setting up a strategy to acquire all the information she was going to need to finish her research in two additional trips. 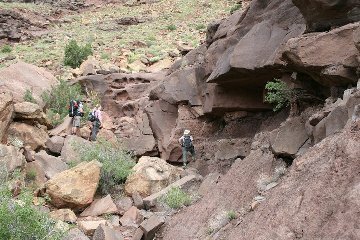 There is a very narrow window of opportunity to get to the site because of weather and river conditions. 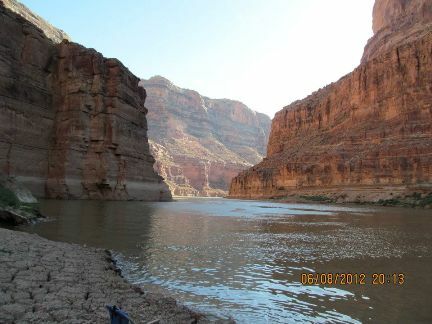 The second trip was at the end of August last year and she and Chelsea, her river guide for all three of her trips, spent 21 days in the baking sun (average temp of 100). 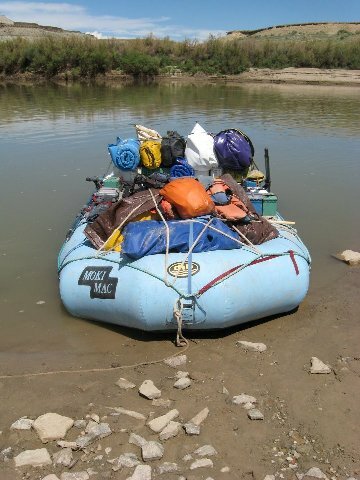 The raft above is packed for two people for 21 days. 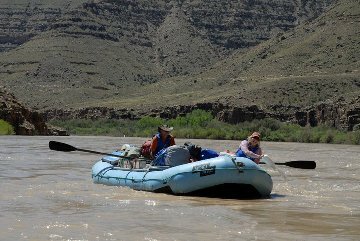 Her site is only accessible by rafting down the Green River for three days and then another full day rafting out. 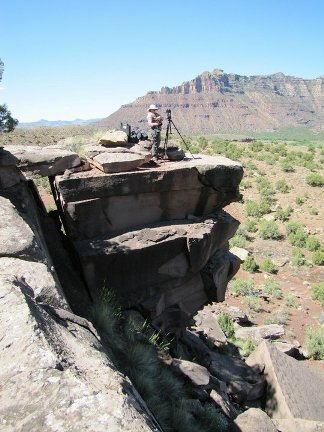 They spent some time directly across the river photographing the outcrop with a gigapan system and visiting a natural spring where they were able to acquire fresh water to bring back to camp for purification. They set up a secondary camp near the old McPherson Ranch and spent a couple of nights there. The rest of the time they spent hiking up “her mountain” and while Chelsea found a shady spot to read, our daughter “worked the channels”. Chelsea was there just in case of accident or injury as the site itself is several miles from camp across a large meadow and then up. Even with really good walkie-talkies it would still take someone a couple hours to get from camp to the research site so Chelsea was her shadow in the field. After the first couple of days and a little experience with heat exhaustion, they began heading out in the pre-dawn hours of the morning using their head lamps to begin the hike. This way she was able to begin her work as the sun came up and get off the mountain before the most intense heat of the day did them in. 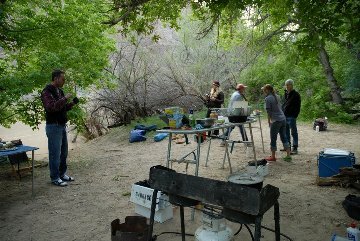 Back at camp, after cooling down in the river, and with a gas powered generator she would upload her photos from the day and work on her notes for several hours. Chelsea would cook and maintain the camp. This was followed by dinner and a quick game or two of rummy and then lights out. By day 14 or 15 they were out of ice and perishables were either gone or inedible. They kept water and beer (yep) cool by floating them in the river. The toilet (above) was full of flying bugs, which was a little nerve wracking, and their clothes, hair and bodies looked and smelled as if they were never going to be clean again. 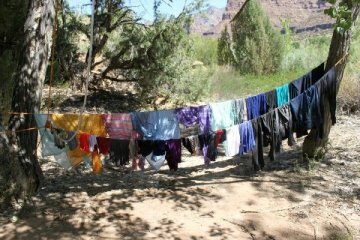 The Green River is not exactly the clearest water in the world for bathing or doing laundry. She’s a very accomplished outdoor person and has spent quite a bit of time in the middle of nowhere for days on end but this trip really tested her. Of course afterward a sense of accomplishment and the benefit of some great stories and useful research information erase most of the worst memories of the trip, and there were more than a few. She’s actually looking forward to the next trip. She leaves Saturday for her third trip. This one will be four weeks (28 days) and she’s taking along another geologist as well as her trusted side kick and new best friend Chelsea, the river guide. Our daughter is 6’ tall and no shrinking violet but she needs help this time because there are a few areas on the mountain she needs to scale down in order to get the last batch of measurements she’d really like to get. They’re also going to work on a project that will depict scale as it’s critical to her project. Her search for a research assistant lasted all year and finally she found Neil, who is apparently excited to experience all the mountain has to offer. He’s also really smart and will be a good brain storming partner to help solve the remaining challenges. She’s hoping of course that they’ll still be friends once it’s over. We’ll be looking for the “all’s well” signal everyday and waiting for that phone call once they get off the raft in the little town of Green River on June 9th.